Kibaale Forest National park covers an area of about 795km and its acknowledged to have one of Uganda's most gorgeous tropical forest. It's a habitat to many forest wildlife and among these includes the 13 species of primates along with chimpanzees, monkeys, gorillas and the southern Kibale connects to the heart of Queen Elizabeth National park. The Forest is covering predominates in the central and northern part of the park on the raised Fort Portal plateau. At the park's northern tip, Kibaale is highest and stands 1590m above sea level. Additionally the wettest area is Northern Kibaale, receiving an average annual rainfall of equal to 1700mm, mainly during March-May and September-November. climate is usually pleasant with an average annual temperature range of 14 to 27oC. Temperatures are at maximum (& rainfall lower) in the south where the terrain drops onto the blistering rift valley floor and forest provides way to open grassland and Kibale-Fort Portal region is one of Uganda's most pleasing places to explore as you may continue to Queen Elizabeth, Rwenzori Mountains & Semuliki National Parks and Southern Kibale joins Queen Elizabeth National Park and together these protected areas maintain a 180km-long migration corridor for wildlife which extends from Ishasha, the remote southern sector of Queen Elizabeth NP, to the Sebitoli forest in the north of Kibale.The diversity and density of primates in Kibale is the highest in Africa. The most famous of its 13 species is the chimpanzee, our closest relative. Kibale's 1450 chimpanzee represent Uganda's largest population of this endangered primate. 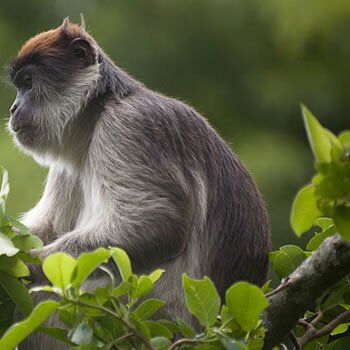 Kibale is also home to the rare I'Hoest's monkey and East Africa's largest population of the threatened red colobus monkey. Other primates include the black and white colobus, blue monkey, grey cheeked mangabey, red tailed monkey, olive baboon, bush baby and potto. Other mammals are present, though rarely seen. These include forest elephant, buffalo, leopard, bush pig and duiker. 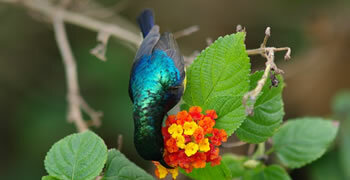 A keen observer may also spot reptiles and amphibians as well as a colourful variety of butterflies. The park boasts 325 species of birds, including 6 that are endemic to the Albertine Rift region, namely black-capped apalis, blue-headed sunbird, collared apalis, dusky crimsonwing, purple-breasted sunbird and red-faced woodland warbler. Other Kibale specials include the African pitta, green breasted pitta, black bee-eater, yellow spotted nicator, yellow rumped tinker bird, little greenbul, black-eared ground thrush, brownchested alethe, blue-breasted kingfisher, Abyssinian groundthrush, and the crowned eagle. It is an extensive park protecting a large block of rain forest that offers some extensive birding. The forest is superficially similar with other rain forests in Uganda although a number of species are more easily found here. Watch for flocks of the rare and localized White-naped Pigeon in flight overhead or sunning themselves in the treetops in the early morning. Fruiting trees attract a plethora of fruitivores including Afep Pigeon, Narina This quite beautiful rain forest allows good views into the canopy and understory.